The Servo-driven Elite Pro II has the same large sewing field as the original Pro in a cast aluminum frame but only weighing in at 159 pounds for better portability. The Elite Pro II has 3 AC Servo motors vs. stepper motors - one for the sewing head, one for the V Pantograph drive and one for the H Pantograph drive. The advantage of the servo-driven machines is higher sewing speeds. The 15-needle compact single head sews at speeds as fast as 1,300 stitches-per-minute on flats and 1,000 stitches-per-minute on caps. 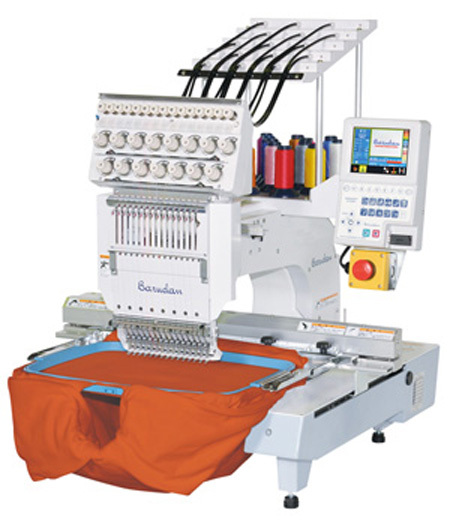 As with all Barudan machines the Pro II offers exceptional stitch quality. Sew both flats and caps on this extremely quiet 15-needle machine. The curved radius cylinder arm enables quick change over without tools or changing throat plates. As with all Barudans, the Pro II offers exceptional stitch quality and reliability.